Who said the French never gave us anything? In 1888, Willie Dunn Jr. designed the Biarritz Golf Club and the par 3 3rd hole which was dubbed “the chasm”. The chasm was adopted by C.B. Macdonald as a template hole and named “the biarritz.” Fellow architects were slow to grow fond of the bold and controversial putting surface that Macdonald was employing and called it “Macdonald’s Folly” in the early years. Biarritz holes are long par 3’s designed to test a player’s ability to hit accurate long shots, a typical yardage is 210-240 yards. It’s defining characteristic is the massive green that at some courses stretches nearly 80 yards. The large green is bisected by a deep swale in the middle of the green that is usually 3-5’ deep and is protected by narrow bunkers that run down the right and left side. As you will see below, in some cases the front-tier of the biarritz is fairway rather than green, as the best pin positions are on the back portion of the green protected by the deep swale. While Macdonald and Raynor limited the biarritz green to par 3’s, modern architects have begun to use the biarritz on par 4's and 5’s, making the swale large enough to accommodate a pin position. The biarritz is a fantastic design, it tests the skill and accuracy of a player with their longer clubs. Originally, the biarritz required a driver but with technology advancements, today it stands as a great long-iron test. The hole presents a bevy of shot options and a variety of yardages. Due to their immense size, a biarritz hole's distance can range 60-70 yards on a given day, changing it from a birdie opportunity to a tough par. The green allows a player to hit any type of shot in, a low running shot or a high shot are both equally effective. It is extremely important to hit your shot to the correct level as putting through the swale is difficult. Macdonald’s first implementation of the biarritz template came at the Piping Rock Club in Locust Valley, New York. Here the tough, long par 3 closes out the front 9 and the front half of the biarritz is kept as fairway. A couple of unique aspects of Piping Rock’s biarritz are its front bunker and the way the back portion’s rough juts in on the left side. The biarritz at Macdonald's first masterpiece was added during the renovation work done by Seth Raynor in 1925. The 3rd's scale is jaw-dropping. It features a fairway run-up to the swale and is part of the menacing start to Chicago Golf. The green is filled with subtle sections that make average approach shots difficult two putts. The deep bunkers which surround all sides of the green are extremely difficult up and downs. When it was built in 1925, th hole required players to run the ball up, landing it in the fairway short of the swale. From behind the 3rd green. The Camargo Club hosts an annual U.S. Amateur qualifier and the biarritz 8th regularly clocks in as one of the four most difficult holes on the course. The 8th’s front plateau features a fairway slope which makes the front half unpinnable. The green space thus is smaller than most, only 32 yards deep and 26 yards wide. The trench bunkers on the right and left side are particularly deep. These bunkers start at the fairway portion of the biarritz and run through the back edge. The Course at Yale is often considered Seth Raynor’s crowning achievement, its signature hole, the 9th, a bold biarritz. The first challenge for a player is the forced carry over water to the 200+ yard par 3. Once the green is reached, the fun begins as Yale features one of the deepest swales and also has a severe front-to-back and right to left slope in the back portion of the massive green. This is the 9th hole on the first day that the Course at Yale was open in 1925. At C.B. Macdonald's masterpiece in Bermuda, the 13th is the biarritz. Measuring 238 yards from the back tee box the par 3 plays downhill and maintains only the back tier as green. There is a heated debate at the club on whether the front segment should be green or fairway. The back segment of the green complex contains many subtle breaks. Not the longest biarritz but definitely one of the most unique and intimidating. At the Creek Club in Locust Valley, NY, Macdonald built the biarritz hole and surrounded it with water, making a stray shot pay quite a price. The hole today plays much shorter than its original intention, as players now use mid-irons as opposed to fairway woods when it was originally built. Players looking to post a low score at Westhampton have to deal with the biarritz 17th down the stretch. The predominant pin on the 17th is on the back tier which plays between 220-230 yards. The biarritz at Westhampton is more subtle than most Raynor designs. With modern technology this actually makes it easier to run a ball through the swale and play closer to the original intent of the hole. At the Central Florida Raynor gem lies a nice little biarritz. The green is about 50 yards long allowing the hole to play from a mid-iron to a long-iron/hybrid. The day I played the hole, the pin was back, making it play about 225 yards. The hole has the signature trench bunkering on the left side but on the right, the brush tightens the hole and adds a unique difficulty to the hole. The 5th tee shot at Mountain Lake. The challenging 17th at Fox Chapel tests a player’s nerves down the stretch, a hole which some consider the best biarritz in the world. Designed by Seth Raynor, Fox Chapel’s biarritz stretches over 230 yards and is defined by its extremely deep swale (roughly 5’) and its bunkers that stretch the entirety of the green. From this view you are able to see how deep the swale is at Fox Chapel. Another tremendous biarritz at C.B. Macdonald’s SLCC, this design is treacherous for anyone that misses right. An extremely deep bunker guards the right side of the green making for a near impossible up and down. The bunker on the right is dubbed "the bunker of death" because of how deep it is. Tom Doak and Jim Urbina's tribute to C.B. Macdonald at Bandon Dunes features all of Macdonald’s famous templates. Here is the 8th, his take on the biarritz. The elevated tee and typically firm and fast conditions makes this hole play much shorter than the yardage implies. The downhill nature of the front portion makes the hole conducive to a low running shot, a rarity with the game's technological advances. Another modern course that has adopted a traditional Biarritz is Black Creek Club in Chattanooga, Tennessee. Designed by Brian Silva, a Macdonald and Raynor expert, Black Creek’s 17th is one of the best biarritz in golf. The hole stretches to a strong 243 and features a deep swale and nasty bunkers that run down the right and left side. The 17th at Black Creek Club. Photo Credit: Black Creek Club. This next shot showcases the long strip bunker on the right side of the 17th at Black Creek. As you can see, the bunker makes for an extremely tough up and down. The right side of the 17th at Black Creek Club. Photo Credit: Black Creek Club. 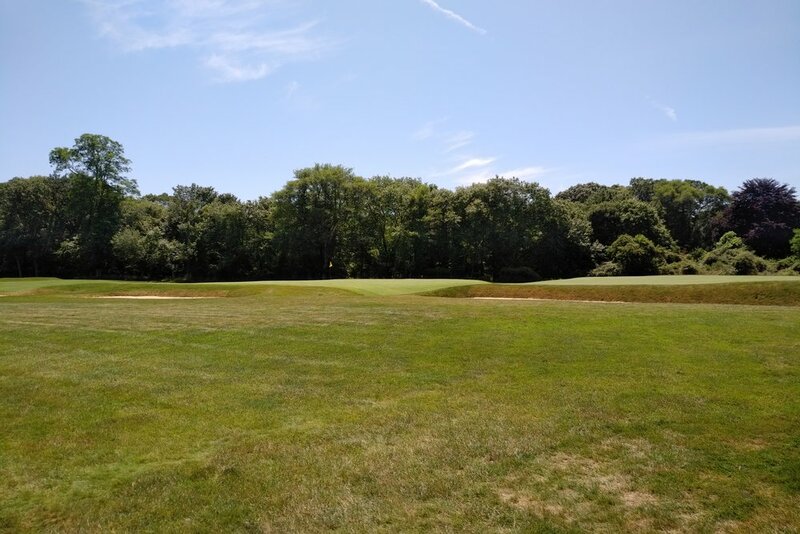 The secluded northeast gem features a terrific biarritz, much like many others, Fishers Island’s biarritz hole features a fairway front portion that leads into the deep swale at the front edge of the green. Seth Raynor showed no mercy when designing this hole, the long shot is particularly difficult when the wind kicks up at Fishers Island’s seaside location. The only example of a Macdonald designed biarritz that is open to the public resides at Greenbrier’s Old White course. This biarritz is a little shorter than most but has all of the defining qualities, the long green, deep swale and narrow bunkers on both the right and left side. One unique aspect of Old White's biarritz is that the middle swale is pinnable as you see by the photo below. My favorite Seth Raynor course is home to a great biarritz. While not as dramatic as some of the others, Shoreacres is as classic as they come. The hole can play from 160-240 yards and typically plays directly into an east wind. Shoreacres also features a unique back bunker that adds to the penalty of missing long. At Raynor’s lowcountry masterpiece, the 16th makes closing out a good round a difficult task. The front half of Yeamans is maintained as fairway and the deep swale makes this hole particularly challenging. The 1925 Seth Raynor design flies under the radar due to its high profile neighbors, NGLA and Shinnecock. The 14th measures about 210 yards to the back pin location. The front half of this beauty is maintained as green and is under 170 yards to the front edge. Another hole that could have influenced C.B. Macdonald is North Berwick’s great 16th which plays as a par 4 with a biarritz like green. The front and back sections are divided by a massive swale which is unpinnable. This green is one of the most wild I have ever seen and makes me long to make a journey to the highly regarded track in Scotland. Another look at North Berwick's wild 16th green. Photo Credit: North Berwick Golf Club. 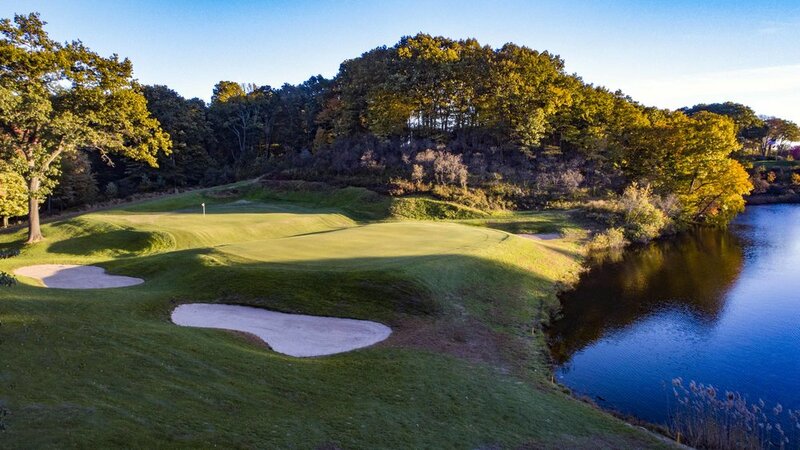 The Milwaukee-area Raynor design starts with a bang as the first three greens are a redan, double plateau and then the difficult biarritz 3rd. The front half plays as fairway and the front pin is particularly tough because of the deep swale that repels any shot just a fraction short. Like most biarritz holes, the right and left sides of the green are flanked by deep trench bunkers. The deep swale at Blue Mound makes for precarious decisions when your shot ends there. The masterpiece on the Hudson River's 7th hole is a rendition of the famed biarritz. This hole plays downhill and its front segment kicks balls onto the back tier. This hole plays shorter because of its downhill nature but when firm and fast the play is short. The back tier of the biarritz has bunkers guarding each side. At the New York Seth Raynor design, the 5th hole plays a lengthy 236 yards. The shot plays a little uphill and features a fairway front tier. Deep bunkers on both sides penalize wayward shots. The green possesses two parallel ridge lines which create a subtle challenge. This is a common trick that Raynor used on many of his biarritz greens. The fifth tee shot at North Shore C.C. Walking up to the biarrtiz green. A look from the side at North Shore's 5th green. The best modern rendition of the biarritz I have seen is at Coore & Crenshaw’s Red Course at Streamsong. The hole is a jaw-dropping display of modern scale and reminiscent of the great biarritz at Yale Golf Club. 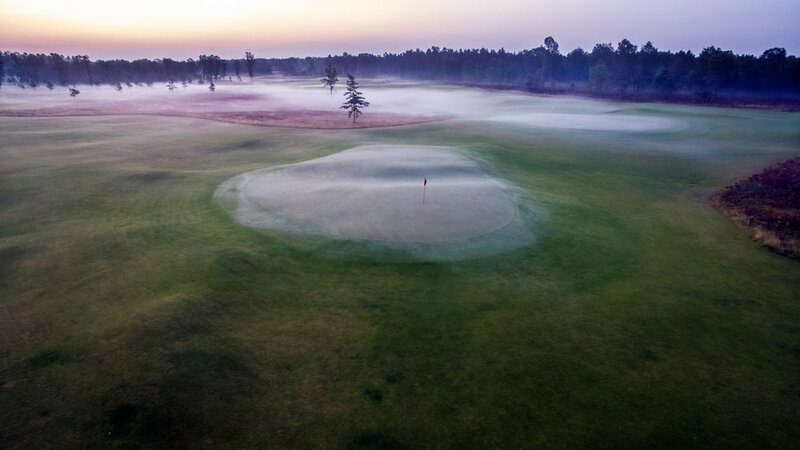 The hole’s bold characteristics include a 7’ deep front bunker, a 20’ deep swale left of the green, a 6’ deep swale and a 72 yard green which allows the hole to play anywhere from 170 to 240 yards. My favorite aspect of this hole is how difficult the front pin can play because of the deep bunker. This puts risk and doubt in a player’s mind and they typically pick the extra club to be safe. The 16th on the Red Course. Modern day architects are taking Macdonald’s templates and adapting them to fit different holes. One of my favorite uses of the biarritz was at Sweetens Cove in Chattanooga, Tennesee. Architect Rob Collins used the biarritz style green on the par 4 8th. He also created a unique twist by angling the green at a 30-degree angle, where a drive down the far right and left sides of the large fairway is rewarded with a straight shot to the pin. Sweetens Cove's 8th tee shot. As you can see, the ideal shot is down the far right and left sides to leave a straight shot to the challenging green complex. Collins’ throws in a couple unique aspects to his green. First, it’s swale is large enough to accommodate a middle pin, and he places a false front in the swale that repels shots that fall short to the middle pin. This was my favorite hole at Sweetens Cove because of how it rewards a well-played strategy. Approach to the 8th green from the right side. The 1929 Charles Banks design in Greenwich, Connecticut is one of the country’s great biarritz holes. Banks put some bold flair into his design at Greenwich. In particular at the 12th, which features a 70 yard long green, a deep swale and side bunkers. 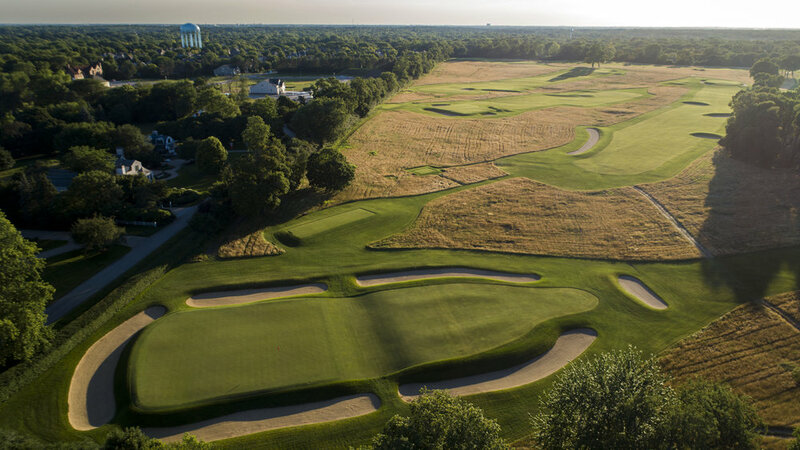 Seth Raynor's Baltimore design has a brawny version of the biarritz hole. Playing slightly downhill, the 13th plays over 250 yards to a back pin, an ideal position to chase a ball back. The 13th has a unique green complex, in it's front section, Raynor used a thumbprint, a trait he usually reserved for his short holes. This thumbprint adds interest to the front pins which measure about 205 yards. The Mike Strantz masterpiece in the Pinehurst area has one of the more unique modern takes on the biarritz hole, not surprising given Strantz. The hole’s front half is green and is a typical biarritz hole, but the back half has a redan shoulder allowing players to funnel shots in from the right side. Playing much shorter than the traditional biarritz, Strantz is able to infuse creativity and a unique twist on a classic design. Architect Dave Esler did a fantastic job renovating Mt. Prospect Golf Club into a public course everyone should check out in Chicago. He built a Macdonald/Raynor inspired course filled with their famous templates. The 16th is a biarritz which plays close to the original intention as the hole stretches to 240 yards to the back pin. The swale is about 5’ deep and it also possesses the great trench bunkers on either side. The Charles Banks masterpiece, Forsgate C.C., has a brute of a biarritz hole. At 235 yards, it’s one of the longest renditions of the hole, but the real challenge comes at the green where Banks employed thumbprint undulations on both the front and back portions, a design often seen on short holes. The added undulation on the green make this one of the most difficult biarritz holes in the world. Originally designed by Donald Ross, Whippoorwill hired Charlie Banks to give its club a facelift in the 20s. Banks came in and employed template golf at this under the radar gem. The 8th is their biarritz hole which plays downhill. This hole is particularly difficult when the pin location is in the back because of the step back to front undulation that Banks built into the green. A.W. Tillinghast’s New Jersey masterpiece, Somerset Hills, is infused with template greens. At the 13th, Tillinghast chose to spice a straight away par 4 up by installing a biarritz green. While Tilly didn’t quite build as deep of a swale as Raynor often did, you have to appreciate the subtlety and naturalness of Tillinghast’s 13th here. A modern example of the venerable hole is Rod Whitman's Cabot Links. At 247 yards the 2nd hole plays close to Macdonald's original intent. Depending on the wind and the pin position this hole can force players to hit driver and run the ball up to the back pins. A twist on the Macdonald version is the left side which feeds shots in rather than a traditional bunker. At Tom Doak's reversible golf course, The Loop, the biarritz green is used as a par 5 on the Red Course and a par 4 on the Black Course. As a par 5 green, it orients sideways. This design provides a test for players looking to get home in two. To find the proper plateau of the green a shot requires excellent accuracy and distance control. On the Black course, the green plays as a par 4 and a traditional biarritz green. The front portion of the green is slightly larger than the back portion. In order to keep an approach on the front portion, it is wise to land short of the green. A miss right will tumble down a severe slope. Have photos of a biarritz hole that needs to be added to this list? Send us an email here.